I watched the season finale of Finding Bigfoot Easter Sunday. I also watched the "behind the scenes" show. I cannot believe that Ranae can't believe that there might be an undiscovered species. That is what cryptozoologist said about the "Silver back" gorillas among other species that have been recently discovered. They discover hundreds of new species each year in the Amazon. I, for one, totally have an open mind when it comes to sasquatch. I live in the Great Northwest and have talked to people who think they have seen them but I have never had an encounter...at least not yet. 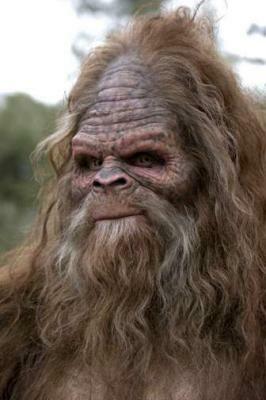 There is also the theory that sasquatch could be Nephilim that the Bible describes in Genesis. Late in the 1950’s, road construction within the Euphrates Valley Turkey, many tombs with giants' remains were discovered. Many of the unearthed leg bones were measured to be 47.24 inches. The Director, Joe Taylor, of Mt. 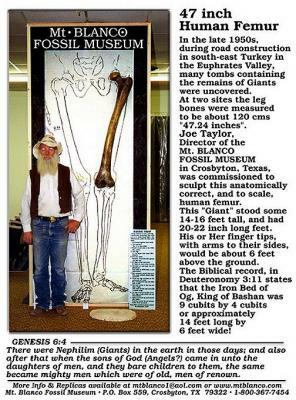 Blanco Fossil Museum in Crosbyton, Texas was commissioned to sculpt the human femur. This particular Antediluvian giant stood approximately 14-16 ft. The Bible's prophecies are 100% true to date and I believe the Bible is the true inspired word of God. There is no reason to doubt the existence of a large humanoid whether Nephilim or undiscovered primate. Have you ever seen a bigfoot? Do you know someone who has? We would like to hear your stories here. Last update on July 27, 8:58 am by CJ.